3. Department of Immunology, Microbiology and Genetics, Faculty of Health Sciences, Ben-Gurion University of the Negev, Beer-Sheva, Israel. A role for lymphangiogenesis in metastatic breast and prostate cancers has been suggested recently. The relevance of lymphangiogenesis in cancer as a rule, and more specifically in classical Hodgkin lymphoma, is poorly understood in comparison with that of angiogenesis. In a preliminary (pilot) study we have investigated the role of lymphatic vessels growth in 19 cases of classical Hodgkin lymphoma stained with the D2-40 (podoplanin) antibody. In each case, three lymphatic vessels hot spots were scrutinized twice. Of the 57 hot spots thus identified, we chose 15 at random for photography, microvessel counting and image analysis. We determined the mean perimeter, surface area, major axis length and complexity factor for each hot spot and correlated them with clinical and biological features of classical Hodgkin lymphoma. No correlations were found with clinical features. No associations were noted with the standard immuno-markers of classical Hodgkin lymphoma. However, significant inverse correlations were shown with pRb, BAX and IκB-α expression. The mean lymphatic major axis length was inversely correlated with the complexity factor. Last, we carried out an additional clinicopathological correlation of the expression of pRb, BAX and IκB-α in a cohort of classical Hodgkin lymphoma patients previously published. Keywords: Lymphatic vessels, classical Hodgkin lymphoma, pRb, BAX, IκB α, complexity factor. Angiogenesis or proliferation of new blood vessels, is one aspect of cancer therapy which have raised controversy. It has been investigated both in primary malignant tumors, like lung, breast and colon cancers, as well as in their lymph node metastases [1, 2]. Considered as a mechanism by which increased dissemination of malignancies is facilitated, it has led to attempts to limit the neoplastic growth by inhibiting blood vessels proliferation . These efforts have not been significantly rewarded to a major extent . More recently, it was suggested that lymph vessels growth or lymphangiogenesis may be apt to fulfill the expectations to a higher degree, where angiogenesis had failed . Classical Hodgkin lymphoma (cHL) is a primary malignant tumor of the immune system. It involves almost exclusively lymph nodes at diagnosis. Whereas angiogenesis and later lymphangiogenesis encompassing lymph nodes, have been shown predominantly in metastatic tumors, they occasionally have been described in primary cancers of lymph nodes, in malignant lymphomas [6, 7]. Rarely, angiogenesis has been investigated in Hodgkin lymphoma. These instances have been explored either with morphometric methods, used to determine the microvessel density, defined by means of aggregates of small vessels, or hot spots, correlated it with clinicopathological features . They may also have been probed by evaluating the expression of VEGF and variants thereof in Hodgkin-Reed-Sternberg tumor cells of cHL. To date, a single paper has approached to a sufficient degree the definition of lymphangiogenesis in cHL . We set out to clarify, in a pilot study, the characteristics of lymphangiogenesis in cHL, using a morphometric technique, as an indication of its clinical and biological significance in this malignancy. Nineteen cases of mixed-cellularity cHL primarily involving lymph nodes were preliminarily selected from our archives, as nodular sclerosis cHL is more difficult to analyze, due to the wide fibrous bands. In order to demonstrate the lymphatic vessels (LV) in formalin-fixed, paraffin-embedded tissue sections, 5 microns thick, we carried out immunostaining with the podoplanin, D2-40 antibody (1:100, Dako) using the avidin-biotin complex method. In each case, three LV hot spots were selected, a total of 57 hot spots. The hot spots were photographed at 200X magnification and printed in black ink on white paper. The LVs were traced onto the photographs: the LV outlines in green and the LV endothelial lining in red. Of the 57 hot spots prepared, fifteen chosen at random, were submitted twice for morphometry. In each case, the mean LV perimeter, surface area, major axis length was evaluated and a mean complexity (shape) factor was calculated, using the microvessel counting and image analysis described by Korkolopoulou et al (8). The complexity factor was calculated as equal to 4π*area/perimeter2. The above LV parameters were correlated with clinical features, including age, gender, ethnicity, stage, systemic symptoms and disease outcome. They were also correlated with CD30, EBV (LMP1 and EBER), CD20, p53, MDM-2, pRB, BAX and IκB-α expression and with the apoptotic index . The statistical analysis used the Mann-Whitney test for non-parametric values and Spearman's analysis for non-parametric correlations. In 10 separate sections of the hot spots, we carried out a double staining in which the LVs were stained with D2-40 and counterstained with Diaminobenzidine (DAB) and blood vessels were demonstrated with the CD34 antibody and counterstained with the AEC substrate. Double staining was based on the method described by Kyzas et al . Photographs of the double staining contrast the blood vessels stained in red and LV in brown. Last, we looked for clinicopathological correlations regarding pRb, BAX and IKB-α gene products, identified in the first part, as relevant for lymphangiogenesis, in the pilot study. Associations between the gene expression were determined with clinical and biological features in a cohort of previously analyzed cHL patients . Lymphatic vessels stained brown with D2-40 (podoplanin) (Figure 1a). A double staining highlighted blood vessels in pink-red (CD34 with AEC substrate) and lymphatic vessels in brown (D2-40 with DAB substrate - Figure 1b). Scarce HRS cells did not demonstrate a specific configuration relationship with lymphatic vessels (Figure 1c). a. The photomicrograph of a classical Hodgkin lymphoma section, highlights predominant lymphatic vessels stained with anti-D2-40 (Podoplanin) in brown (IHC X340 with DAB substrate). b. Double staining of a section of classical lymphoma: blood vessels stain in pink-red with CD34 and lymphatic vessels in brown with D2-40. Note a residual subcapsular sinus on the right margin is highlighted in brown (IHCX340 with AEC for blood vessels and DAB for lymphatic vessels). c. Double staining of a section of classical lymphoma: blood vessels stain pink with CD34 and lymphatic vessels stain brown with D2-40. Note scarce Hodgkin (mononuclear) tumor cells (arrows) show no space association with lymphatic vessels (IHCX340). No significant association was found between the four lymphatic parameters of cHL and the clinical features - age, gender, ethnicity, stage, outcome and death from the disease. No correlation was evident with the following immune markers of cHL: CD30, EBV, CD20, p53, MDM-2 expression. Apoptotic index was not associated with the LV parameters. A significant negative relationship was found however between LV parameters and the pRB expression - with the mean lymphatic area and the mean complexity factor. BAX was inversely and significantly related with the mean surface area and the mean length. IκB-α was inversely and to a significant degree associated with the mean LV perimeter (Table 1). Association between biological sample features and lymphatic vessels parameters. Of all the LV parameters, only the mean LV major axis length was inversely related with the shape factor, to a significant extent (r= - .6; p= .03). The only significant association of the mean lymphatic perimeter was with the inverse IκB-α expression in tumor cells (p = .015). When relating the mean LV surface area with several cHL features, we only found an inverse significant relationship with pRB and BAX expression (Table 2). Table 3 shows that the only significant association of the shape factor was with the pRB expression and it was direct. None of the lymphatic vessels showed in their lumina evidence of Hodgkin-Reed-Sternberg tumor cells of cHL. We next analyzed the comprehensive relevance of the expression of pRb, BAX and IκB-α in a larger cohort of classical HL patients. The only significant link of pRb expression in the larger cohort of cHL patient was with FH6 expression, a sialylated-CD15 antigen, and it was negative (p= .044). Clinically, BAX was inversely related with bulky HL (p= .040). No other significant overall association was found with other clinical traits. Table 4 shows associations between BAX expression and biological markers of cHL. It shows a positive relationship with MCL1, p53 and MDM2 expression, to a significant degree and a significant inverse link with BAK, and BCL2. Within this table is also a correlation of high significance with proteins of the measles virus. Using the Kaplan-Meier analysis, no significant difference was found in overall survival of positive and negative expression of BAX. The multivariable logistic regression relates the measles nucleoprotein and BAX - HR= .643; p= .004. Association between lymphatic vessels area and Hodgkin lymphoma features. Association between the complexity factor of lymphatics and Hodgkin lymphoma features. NED - no evidence of disease. AWD & DOD - alive with disease or dead of disease. BAX expression and biological characteristics of classical Hodgkin lymphoma. MV - measles virus protein. MV-NP - Measles virus nucleoprotein. Table 5 reveals significantly inverse associations between IκB-α expression and the measles nucleoprotein and hemagglutinin. No variation was found between positive and negative expression of IκB-α, by Kaplan-Meier analysis. The multivariable logistic regression correlating with the measles nucleoprotein with IκB-α - HR= .206; p= .010. In addition, an inverse relationship between this gene expression and the LMP1 of EBV is also significant. In addition, IκB-α was related significantly to two non-sialyl-CD15 antigens, LeuM1 and 80H5. No such relation was found with sialylated-CD15. IκB-α expression associated with biological features of classical Hodgkin lymphoma. LeuM1 and 80H5 - antibodies against non-sialyl-CD15. 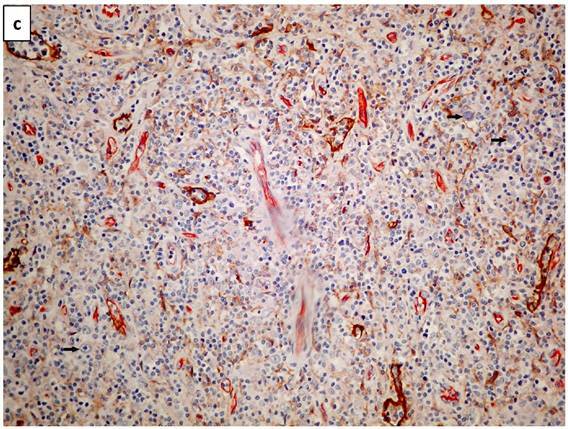 LeX1 - against sialyl-CD15. MV-Ha - Hemagglutinin measles protein. MV-NP - Measles virus nucleoprotein. Lymphangiogenesis has shown different properties and significance when compared with angiogenesis in primary epithelial malignancies, as well as in the related lymph node metastases [13, 14]. However, the theme of our paper is the nature of lymphangiogenesis in the malignant tumor, cHL, which develops primarily in lymph nodes. In addition, the mode of spread in cHL, at least at the disease outset, is from one group of lymph nodes to its neighbor. A single paper has approached the estimation of lymphangiogenesis in cHL, by assessing VEGF in cHL patients. These authors showed limited findings on the positive expression of VEGFC in Hodgkin-Reed-Sternberg cells, in the patients' sera as well as on its gene expression . Since lymphangiogenesis in cancer seems to raise a debate on its possible role in various malignancies [15-17], we opted for studying its significance in cHL and also for the use the morphometric approach. Lymphatic vessels were defined by immunohistochemistry with the D2-40 (podoplanin) antibody and when relevant, with the double staining by including in addition the CD34 antibody. In cHL, HRS cells may be numerous, but are far more often scarce (0.1-1%) within a reactive cells background. We found no specific structural relationship between HRS cells and lymphatic vessels (Fig. 1c). As lymphangiogenesis was determined by identifying hot spots, no relation was found between them and the distribution of the HRS cells (which are dispersed in loose aggregates in the lymph node section). Of note, in the study of angiogenesis in cHL, no particular relation between blood vessels and HRS cells was described, to our knowledge. Figure 1b, with its opened subcapsular sinus, is the nearest to a reactive lymph node, as the involvement with cHL is partial. The lymph vessels distribution is therefore variable. We defined 4 morphometric parameters for each LV: its mean perimeter, its mean surface area, its mean major axis length and a calculated factor of complexity . The number of cases studied was limited, due to the preliminary (pilot) nature of the study. But, each was studied twice and each case was represented by 3 different hot spots. We analyzed by morphometry 15 hot spots. Our main positive findings concerned a statistically significant association between pRb expression and two LV parameters - the mean lymphatic area and the mean complexity factor, both inversely. Modulation of angiogenesis by pRb has been described in various tumors [18-20]. The involvement of the pRb pathway in angiogenesis have been demonstrated using the papillomavirus oncoproteins. However, this gene has not been associated with lymphangiogenesis. BAX expression was negatively and significantly related with the mean LV surface area and the mean LV length. In contrast, VEGFC expression in carcinoma of the urinary bladder correlated directly with the BAX expression (21). It is of note that BAX expression is often correlated with that of bcl-2; bcl-X and Mcl-1 and is not necessarily correlated with the presence of apoptotic tumor cells , or with survival . IκB-α was inversely and significantly associated with the mean LV perimeter. This gene has been considered as a regulator of angiogenesis, but no such relation has been recognized to date with lymphangiogenesis . Thus inhibition of IκB-α may promote NF-κB signaling and together with it, angiogenesis. It remains to find out if lymphangiogenesis would also be activated by this association. The only correlation found with the mean LV complexity factor was inverted and was of the mean LV major axis length. It is proposed that during a lymph vessel maturation, it may undergo modulation from a small and complex figure to a longer and simpler form. However, most variables, clinical or biological were not associated with either of the LV morphometric characteristics. On a wider perspective, anti-angiogenetic therapy may not have completely fulfilled all the expectations invested in it . We have mentioned above the practical lack of documentation on lymphangiogenesis in cHL. The impact of angiogenesis in cHL is also very limited, both in extent and in significance [7, 25-27]. Nevertheless, angiogenesis in cHL is not the issue here and no evidence is found that we can extrapolate these data to the status of lymphangiogenesis in this form of cancer. 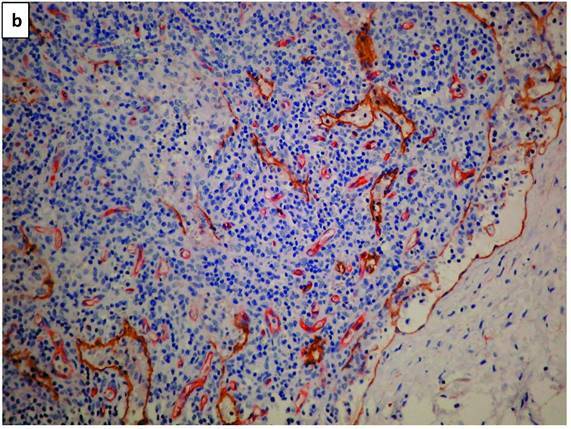 In any case no lymph vessel in our material contained cHL tumor cells. In summary, the morphologic-pathologic pilot survey establishes in cHL a notable lymphangiogenesis which has not been demonstrated to date. The lymphatic vessels scrutinized herein showed variations in all their morphometric parameters. We found no clinical nor biological correlations with the lymphangiogenetic features displayed. The expression of three genes represented the major statistically significant findings of the study: a negative association between the LVs and pRb, BAX and IκB-α and LV characteristics. Moreover, the relation between the three genes and cHL, have been investigated in a second part of the paper, in a more extensive cohort of cHL patients . The findings of this expanded study are segregated into three main topics, all integral parts of the cHL research. The most striking associations were with the expression of measles virus proteins, notably with BAX and IκBα expression, and therefore with lymphangiogenesis. We have noted extensively, in the past, an association between cHL and measles virus . Moreover, a connection with apoptosis modulation as a possible mechanism, has been already raised . We have also suggested that the major role, attributed to NF-κB in the pathogenesis of cHL, may not be absolute . The second group of findings is related also with apoptosis regulation. They deal with BAX expression. Notably, the relation and associations of the members of the BCL2 family of proteins, are not straightforward, this finding has been established previously  and no relationship with cell survival is to be found . It seems the overall level distribution of all the components of the BCL2 family is of more significance than the status of each individual member of the family. The activation of the different members may also be critical . The association of the tumor cells apoptosis with lymphangiogenesis, although not immediate, is clearly present, if one recapitulates the results of the pilot study. 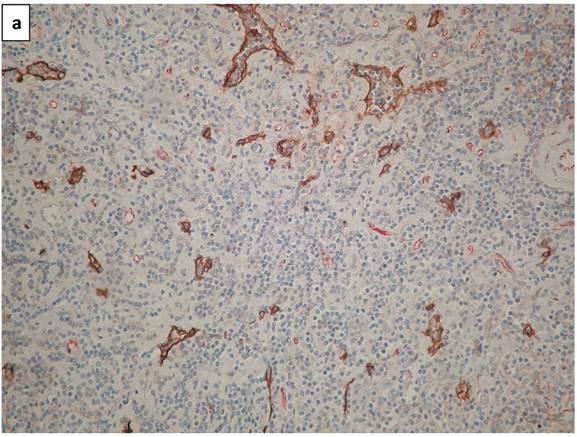 A third category of findings is related with the link between pRb and the sialyl-CD15, and that of IκB-α and the non-sialyl-CD15 antigens which carry an immunomorphologic relevance in this malignancy. This may represent a new association with the CD15 antigens, not described to date, which will need deciphering, in the context of lymphangiogenesis. Thus, lymphangiogenesis in cHL may present various biological effects, which are not necessarily expected. In Memoriam: Dr Isebrand Prinsloo was the initiator and motor of this study and he departed before he could finalize it. We thank Kibbutz Sde-Boker; the Israel Science Foundation, the Israel Cancer Association, the Israel Ministry of Health and the Holzer Family Foundation for their partial support. Corresponding author: Prof. Daniel Benharroch, Department of Pathology, Soroka University Medical Center, 1, Izhak Rager Boulevard, P.O.Box 151, Beer-Sheva 84101, Israel. Tel. +972507579140. e-mail: danielbenharroch1com.